Minimally invasive parathyroid surgery includes video-assisted or endoscopic parathyroidectomy, when surgeon uses camera to magnify the view. This technique makes the healing process faster and with minimum scar formation. 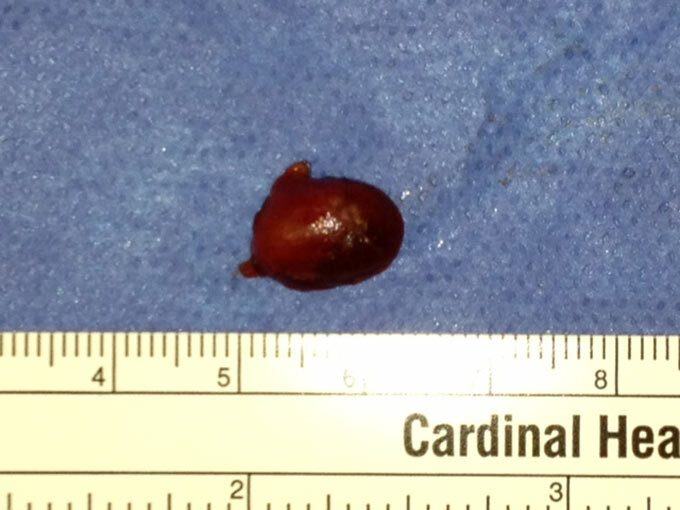 In order to do minimally invasive approach we utilize intraoperative parathyroid hormone (PTH) monitoring to determine the cure after the removal of parathyroid adenoma. About 85 % of the patients with primary hyperparathyroidism (click here to read about primary hyperparathyroidism) will have just one parathyroid adenoma. In order to perform minimally invasive parathyroid surgery, preoperative imaging studies are used to identify and accurately locate the affected parathyroid gland or glands. Two imaging studies, parathyroid ultrasound and Sestamibi scan, are require for precise preoperative localization of parathyroid lesions in patients with hyperparathyroidism. Our Parathyroid Canter is utilizing high sensitivity parathyroid ultrasound machine. 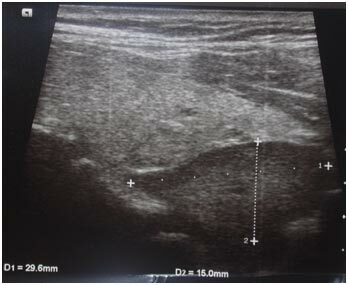 Dr Shifrin performs his own parathyroid ultrasounds (US) on all parathyroid patients prior to surgery (Figure 1). 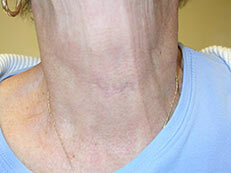 The sensitivity rate is approximately 75-80% for localizing of parathyroid adenoma. The second study is 99mTc-sestamibi fusion single-photon computed tomography (SPECT) and computed tomography (CT) images (SPECT-CT) is the newest and highly sophisticated imaging technology that designed by fusing 99mTc-sestamibi SPECT and CT slices using fusion software. 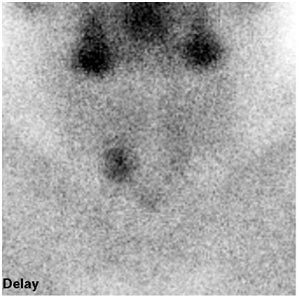 Dual-phase 99mTc-sestamibi scintigraphy with SPECT-CT enables to identify a parathyroid adenoma in about two-thirds of patients with primary hyperparathyroidism and allows the surgeon to plan appropriate surgery). Combination of two positive tests, US (Figure 1) and 99mTc-sestamibi scintigraphy (Figure 2) with SPECT-CT, results in 90-95% sensitivity in localization of parathyroid adenoma and success of minimally invasive surgical exploration. 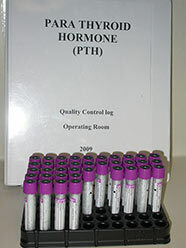 Each parathyroid surgery procedure is performed with intraoperative parathyroid hormone (PTH) monitoring. 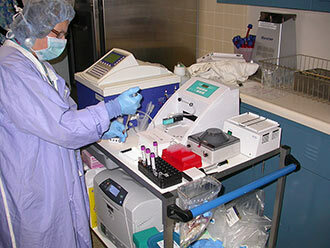 Blood tests for PTH measurements are taken right during the surgery. 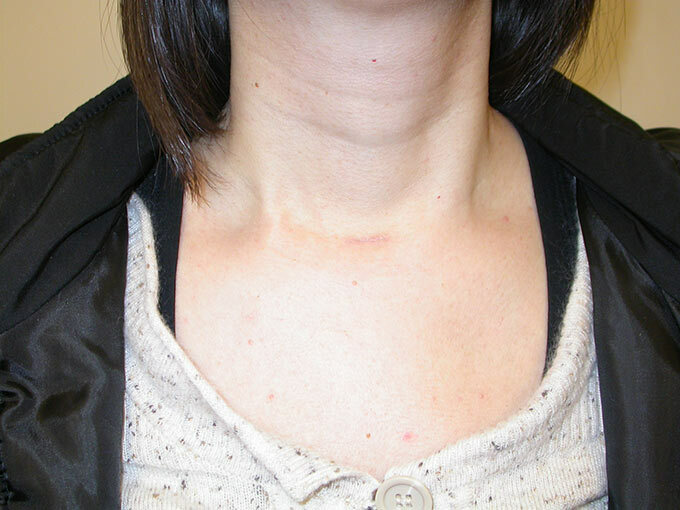 There are at least 4 measurements: right before surgery is started (baseline level), during removal of the parathyroid adenoma (T-0 level), in 5 and 10 minutes (T-5 and T-10 levels) after removal of adenoma. 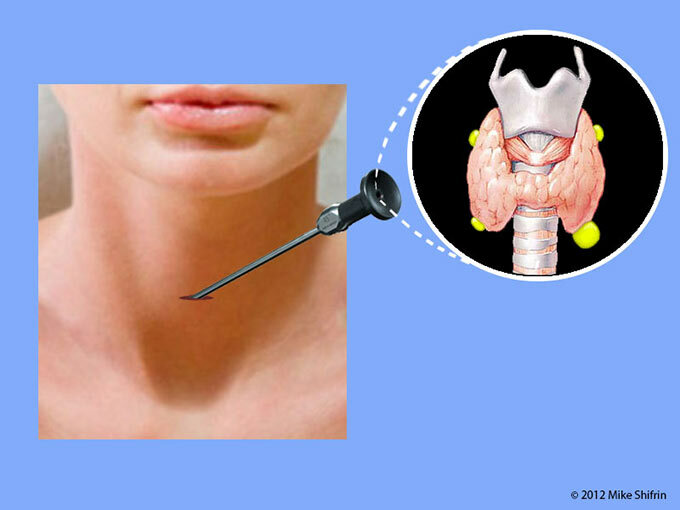 Intraoperative parathyroid hormone monitoring determines the cure if either T5 or T10 levels dropped more than 50% compare to either T-baseline or T-0 levels after removal of the adenoma ("Miami criteria" developed by Dr. Irving). On the picture bellow you can see technician who is assigned to my surgeries and performs PTH measurements in operating room during each parathyroid procedure. 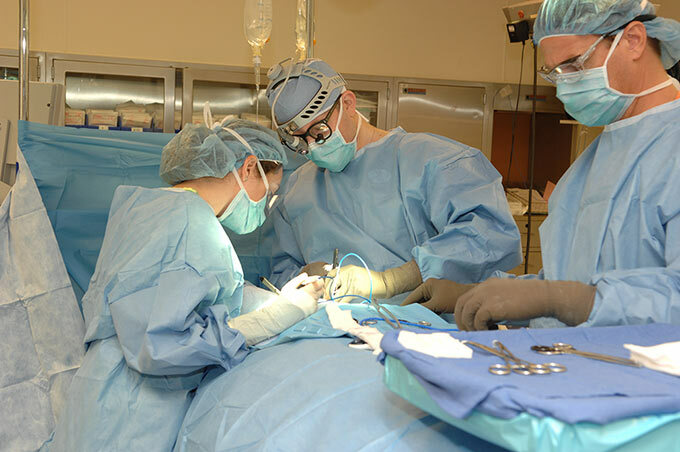 Surgery is performed as an outpatient procedure. The average stay after the surgery is about 3 hours. Most patients do not require overnight stay. Most patients have little or no pain. 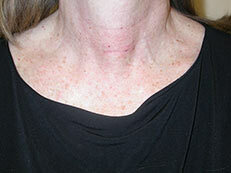 Most patients have this procedure performed under general anesthesia. If procedure is preformed under general anesthesia, the pain is minimal; if procedure is performed as a local-regional block with general light sedation, the neck block would last for about 6 - 8 hours. Some patients may feel discomfort or pressure after the surgery. It normally resolves within couple of days. If procedure is performed as a local-regional block with general light sedation, then some patients might feel shoulder/arm weakness after the neck block, which also resolves within 4-8 hours after the surgery. Postoperatively most of the patients have no pain at all. If you do develop mild pain at home, you can take either Tylenol or Motrin. The stitches will be removed the day of the surgery, right before you go home. You will have just a strip of skin glue on the skin. It will peel off on its own in 6-8 days. 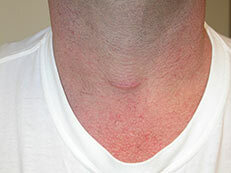 Because the incision will be small and the stitch will be removed the same day of the procedure the size of the scar will be much less than that with traditional parathyroid surgeries performed in the past. The incision will be placed in the natural skin crease of your neck, which will help to make it less noticeable or not visible at all. 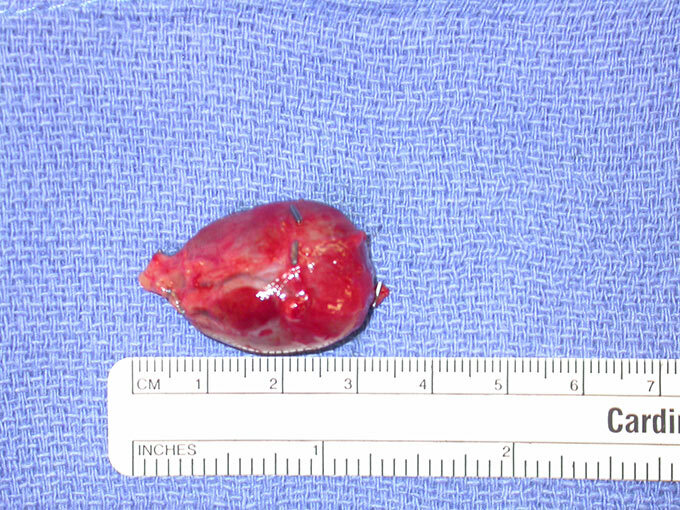 Click on image to view video “Minimally Invasive Video-Assisted Parathyroidectomy"
Only 0.5% (1 in 200) patients experience complications related to the damage of the nerve that goes to the vocal cords. 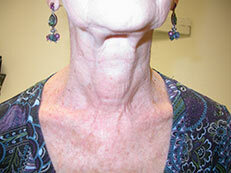 When this occurs the patient will have hoarse voice or inability to make high-pitched sounds. In about 1 in 50 operations patient might experience temporally voice changes which resolve in 8 to 12 weeks. In about 1 in 100 patients that were operated on and had 3 and ½ parathyroid glands removal for parathyroid hyperplasia may experience permanent low calcium levels. If it happens, patients need to stay on several times a day calcium and vitamin D supplementation for a life. Because of the nature of the surgery, all patients will go home on calcium pills for 2-3 weeks. If patient develops cramps in their hands or legs, or tingling of the face muscles it means that the calcium level is low. In this case you should immediately take 2 calcium pills (1000 mg) and call your doctor. With current technique the incidence of bleeding is close to zero. With current technique the incidence of wound infection is close to zero. You do not need any antibiotics for the surgery, unless you have condition which requires you to take antibiotics with every procedure. The skin glue will peel off on its own in about 6-8 days. After that you can apply Mederma or lotion with Vitamin E about 3-6 times a day to the wound. Try not to have sun exposure to the wound for about 1-2 months (especially during summer months), such as it will cause skin discoloration in the wound area and it will look different from the other skin areas. It is better not to drive for several days if you feel uncomfortable moving your neck. Do not drive if you are taking narcotics such as Percocet or Vicodin. There are no significant physical restrictions, but it is not advisable to do any stretch exercises to your neck for 2-3 weeks. Most of the patients resume their normal physical activities within day after the surgery. You can take shower next day. Do not scratch or peel off the skin glue, just wipe it with the towel. Usually available within 5-7 days after the surgery. Please immediately call doctor if you develop significant neck swelling or shortness of breath shortly after surgery, or you develop cramps in your hands or legs after the surgery. 2-3 weeks after the surgery: for wound check, pathology report, and PTH and calcium check. 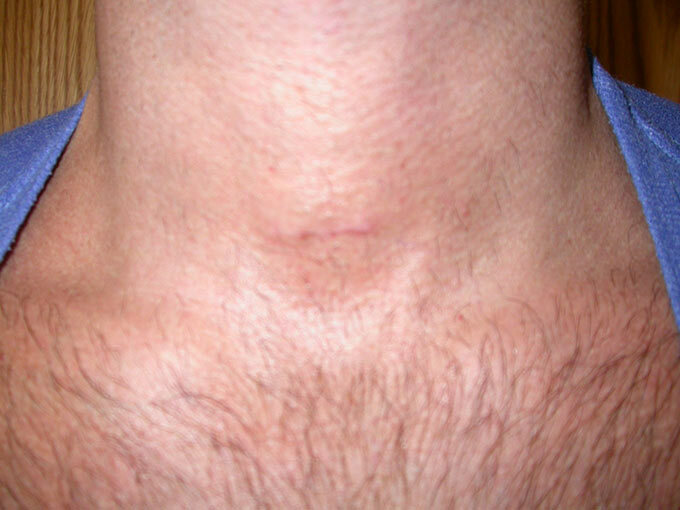 Scar, 2 weeks after a minimally invasive, VIDEO-ASSISTED (with camera) parathyroid surgery, an approach from the left side. 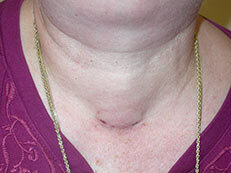 Scar, 2 weeks after a minimally invasive parathyroid surgery for the large parathyroid adenoma (pictured below). 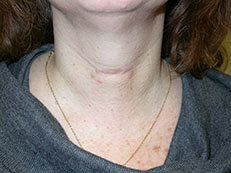 Scar, 8 months after minimally invasive parathyroid surgery. 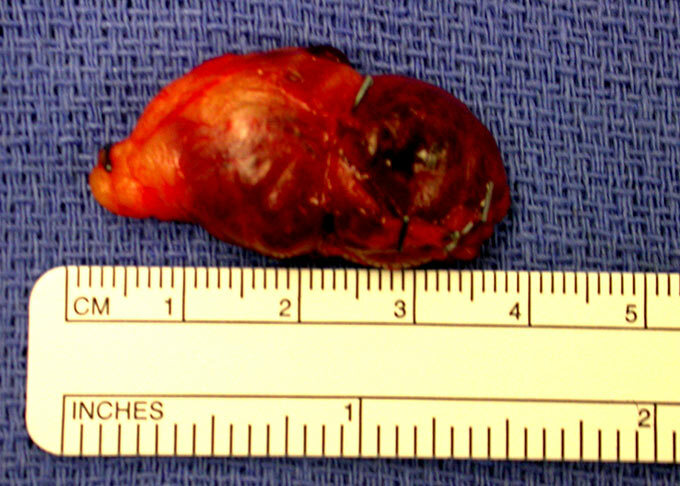 A large parathyroid adenoma 6g, 3.3 cm x 2 cm (removed from the patient pictured above). 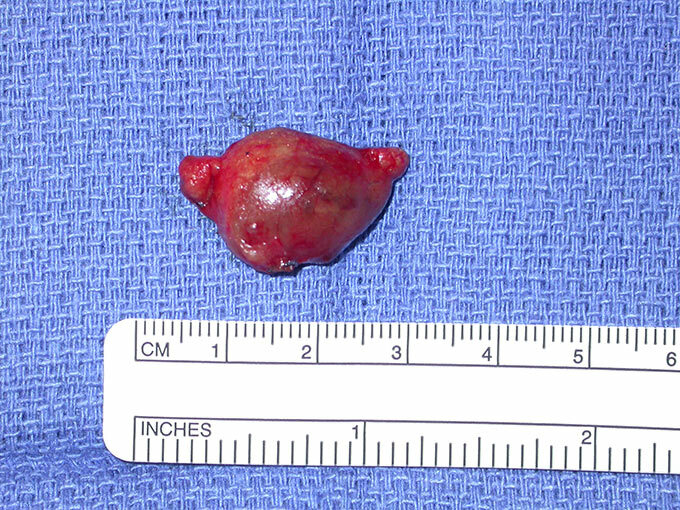 A large right upper parathyroid adenoma. 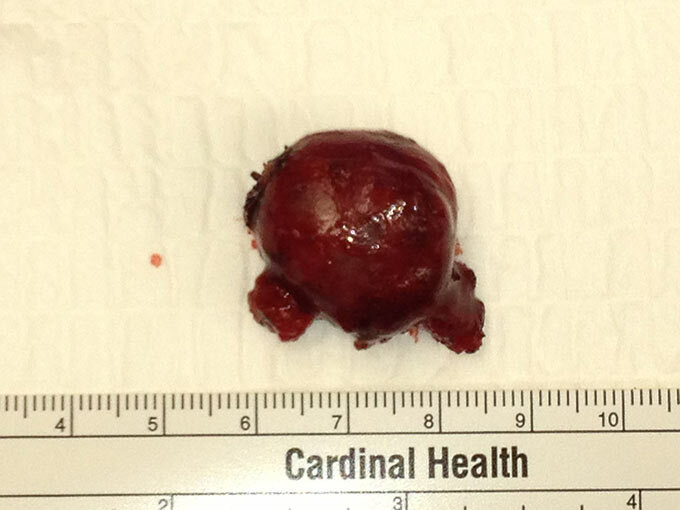 Parathyroid adenoma, that was removed during a minimally-invasive parathyroid surgery. 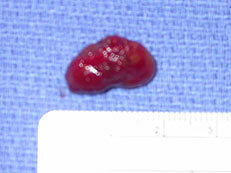 Large parathyroid adenoma, removed during minimally-invasive parathyroid surgery. 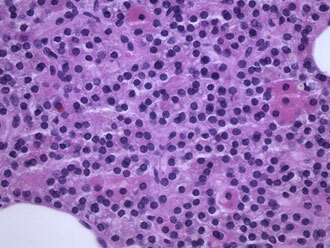 Left lower parathyroid adenoma from the patient pictured above. 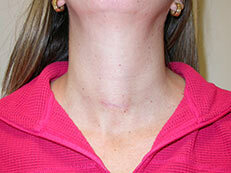 Scar, 2 weeks after a minimally invasive parathyroid surgery with removal of the right lower parathyroid adenoma. 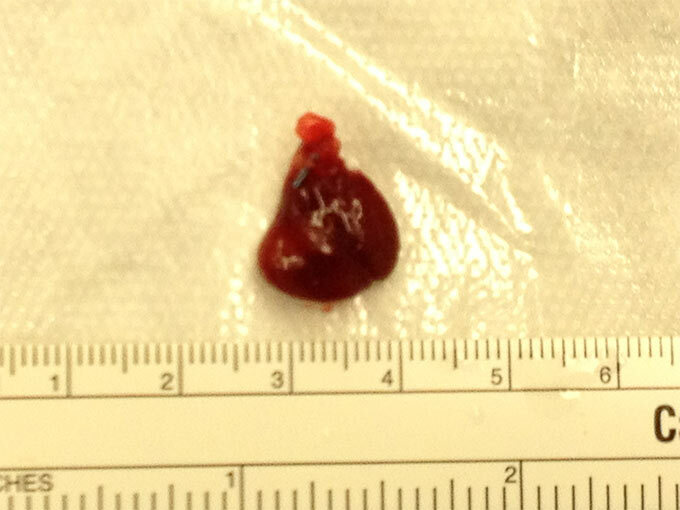 Scar, 2 weeks after parathyroid glands exploration with findings of the right upper 1.5 cm parathyroid adenoma. 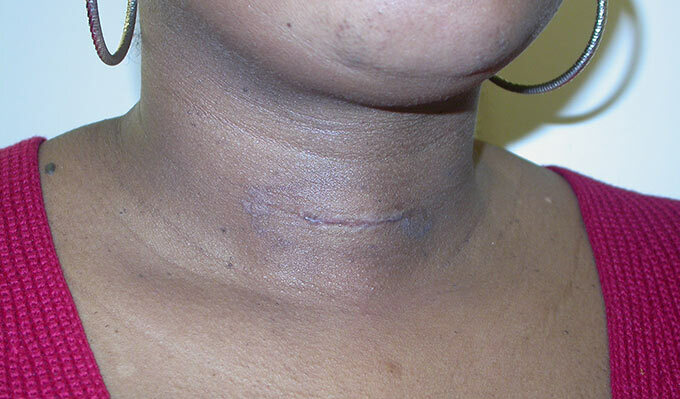 Scar, 2 weeks after parathyroid glands exploration with findings of the right lower parathyroid adenoma. 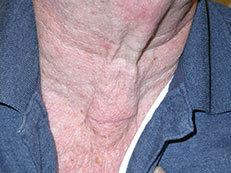 Scar, 4 years after the minimally invasive parathyroidectomy with removal of the right lower parathyroid adenoma. 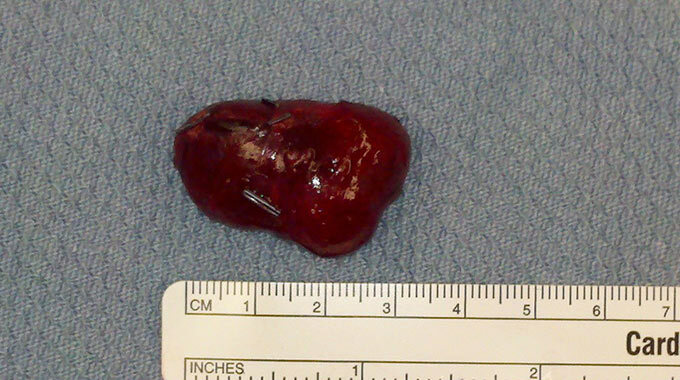 Scar, 2 weeks after a minimally invasive parathyroidectomy with a removal of the right lower parathyroid adenoma. 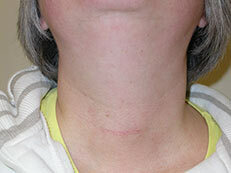 Scar, 2 weeks after a minimally invasive parathyroidectomy with a removal of the left upper parathyroid adenoma. 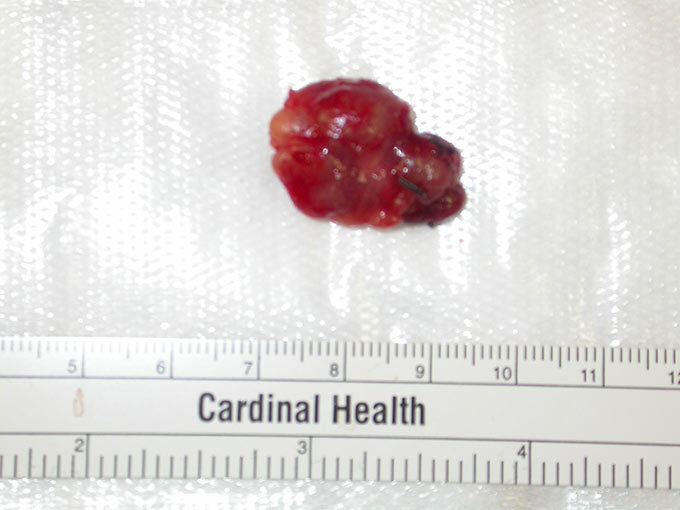 Scar, 10 days after a minimally invasive parathyroidectomy with a removal of the left lower parathyroid adenoma (right after the skin glue came off).